Collect email addresses with Android using Email Sign Up version 2.0. Available on Google Play and Amazon. This app replaces paper sign up forms and eliminates transcription errors when adding people to a mailing list. 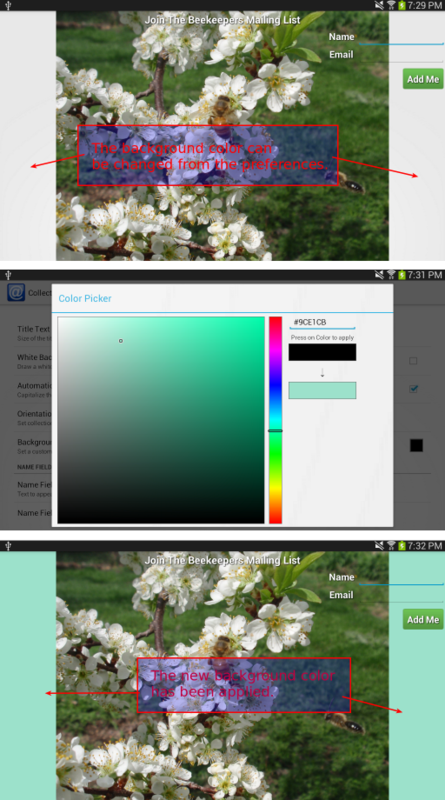 The newest version of Email Sign Up allows you to choose a custom background color. This is helpful when your background image is smaller than the display of your tablet. For example, if you have an image file of just a logo. You can collect email addresses at a live event or conference. With the most recent update, people’s names will automatically capitalized. 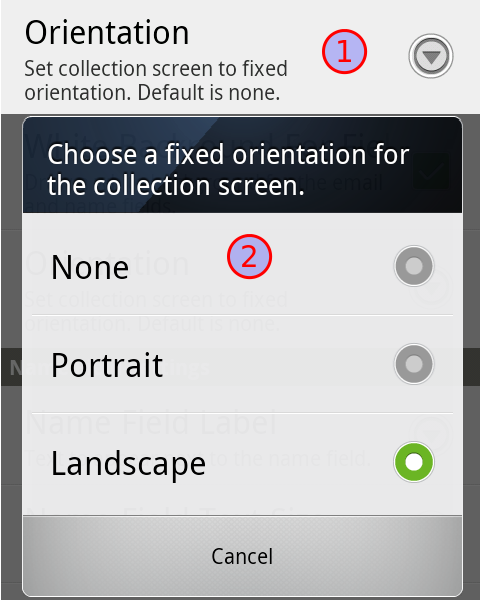 The text in the optional custom text fields will also be capitalized by default. This helps maintain consistent formatting for the data that is entered. The auto capitalization can be turned off from the preferences screen. See below for more screen captures. Email Sign Up on the Amazon app store. How to import email address csv file to gmail. 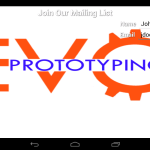 Evo Prototyping customizes the app with their own logo. See how people are using the Email Sign Up app. I just published the first case study to show how Evo Prototyping uses the app. 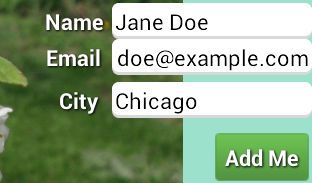 Collect email addresses with Email Sign Up for Android version 1.9. Available on Google Play and Amazon. This app enables you to grow your email list by collecting email addresses with your Android tablet. The newest version of Email Sign Up allows you to lock the orientation of the email collection screen. You can already choose a carefully designed background image. However, the image usually looks best in a specific orientation. Now you are able to force the email collection screen into the desired orientation no matter how many times the user rotates the device. The app is designed to be used at live events or trade shows. The latest version allows you to assign a name to the current event where you are collecting new subscribers. This event will be added to the beginning of the automatically generated file name for the CSV file that stores the subscriber data. 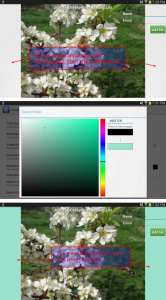 The screen captures below show you how to use the new features. 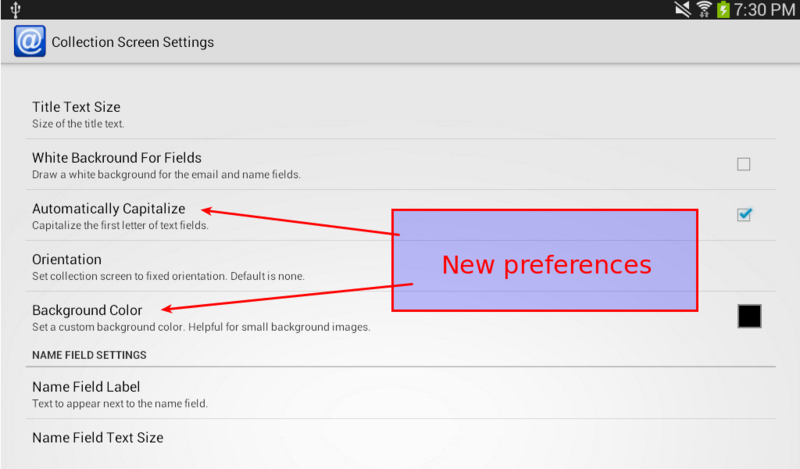 The orientation of the email collection screen can be set from the preferences screen. Click to enlarge. 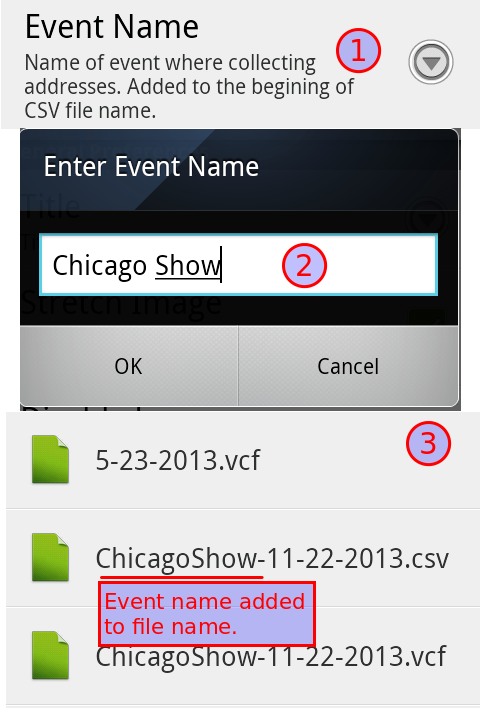 Assign an event name and it will be added to the beginning of the file name. Click to enlarge. Email Sign Up version 1.4 is now available on the Google Play store. 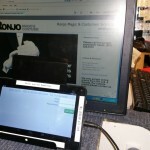 This app allows you to collect email addresses using an Android tablet. 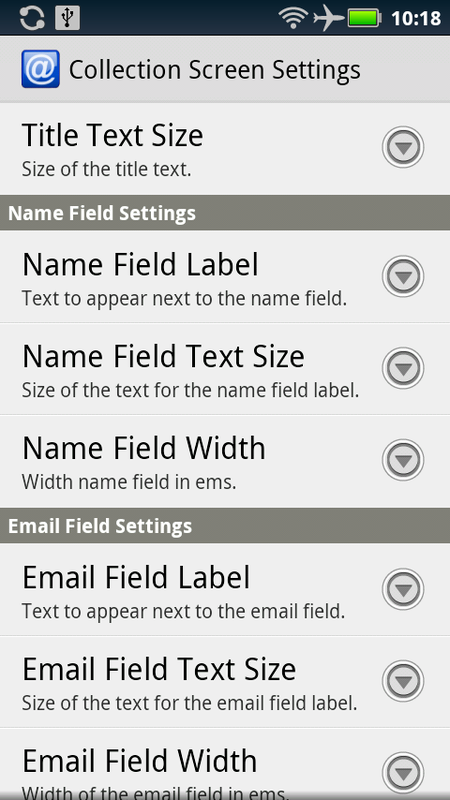 The size of the title text, name label, email address label and button text can be changed. The text that appears on the sign up button can be changed. 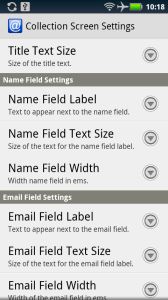 The text that appears next to the name field and email address field can be changed. The width of the name and email address fields can be changed. 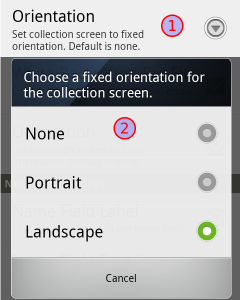 There is now a Collection Screen Settings preference screen.